When you take a step back and look at an outdoor space there are simple designer style tips to make your space truly yours. For an affordable yet impactful way to help transform your outdoor space in to your own personal oasis, we are sharing our top five tips on how to maximize the most of your time outdoors this summer! The great Canadian outdoors? Get back out there, say Colin and Justin, with simple ideas to make the most of your outdoor space. As recent Canadian cottage goers we understand that Canadians live for time outdoors. After months on end of subzero temperatures patio season is always well celebrated- whether in our backyards or away at our cottages. Some spaces may need a larger overhaul while others just need a little touch up or refresher. It will always be up to you to decide what your space needs to make it truly your own and sometimes that can be a daunting thought. If you take in to consideration that there are a world of patterns, a world of colours and a world of selection, it's hard to know just where to begin. The good news is, it starts with you. 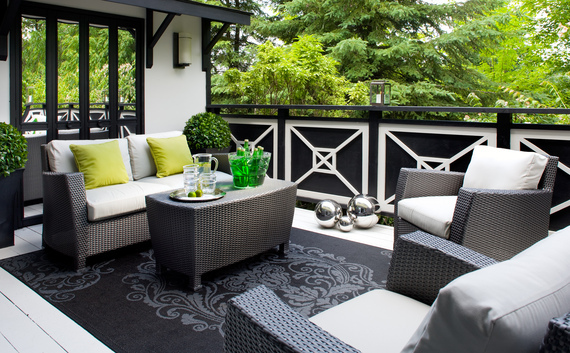 When you take a step back and look at an outdoor space there are simple designer style tips to make your space truly yours. For an affordable yet impactful way to help transform your outdoor space in to your own personal oasis, we are sharing our top five tips on how to maximize the most of your time outdoors this summer! 1. 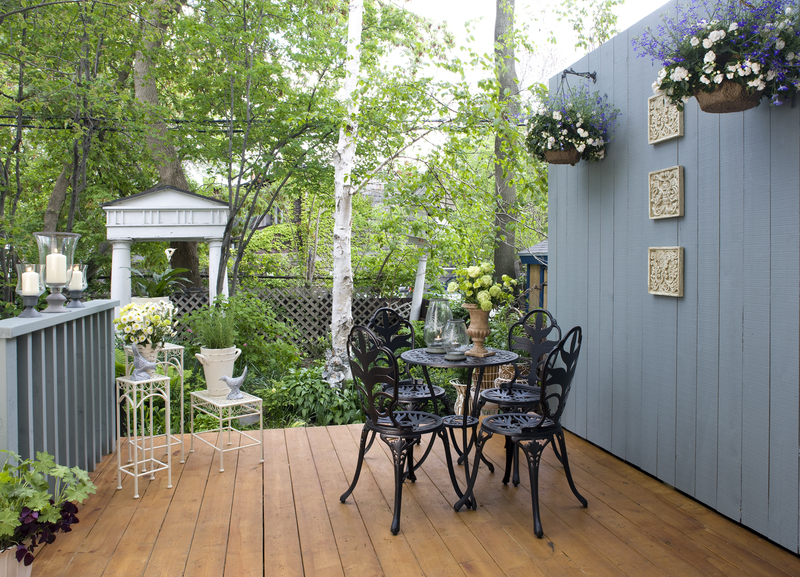 Give your outdoor space an identity -- Look at your bare deck or backyard as a blank canvas and give it a practical edge -- install a usable function. For example a lot of cottages have inside spaces that are too small to host. Good news, there is a world waiting for you outside! Try installing a table and chairs to create a seasonal dining room to enjoy with family and friends in the warmer months. Go on -- kick start your very own "patio season" each year! 2. Warm it up -- When the nights start to cool a little, you'll be itching to stay outdoors just a little bit longer. A good way to extend your time outdoors is by opting for an outdoor fireplace, a fire pit or a patio heater. We have a Solus http://www.solusdecor.com gas bowl fire at our cottage and we use it regularly -- even in the depths of winter for a flaming good time in the snow! 3. Don't let bugs bug you... Once dusk hits, so do the mosquitoes. No one wants to be shut away indoors in the warmer weather, especially when you could be roasting marshmallows by the camp-fire or talking with friends on the lawn chairs, so use bug protection to keep mosquitoes at bay. Avoid pools of standing water (overflowing planters etc) that will attract mosquitoes and use a sprayless and odourless repellent like the OFF! Clip-On Mosquito Repellent. This handy repellent turns on in one simple switch to provides head-to-toe protection while enjoying your relaxing outdoor activities. 4. Accessorize, accessorize, accessorize... If you can't quite stretch to a whole new look for your patio or deck, then try creating a new look for less with accessories. Stores like Homesense, Winners and Chapters are great for seasonal accessories. Learn to be bold with bright cushions, outdoor throws and pillows. Add candle storm lamps, colourful plastic pitchers, glasses and outdoor accessories to bring joy to an otherwise lifeless space. You KNOW you want to! 5. Planting -- Soften up your deck or patio with some planting. Hanging baskets bursting with colour looks amazing and tall trees in smart planters ooze sophistication. If you don't exactly have a green thumb, then don't say NO...say FAUX! Embrace a little fakery with realistic looking topiary in modern smart planters. Homesense http://www.homesense.ca/en/index.asp carries an amazing range of what we call 'affordable permanent botanicals'. Summer months are made for outside and no matter where you are spending your relaxing warm weather moments one thing is for sure -- it should be aesthetically beautiful so you can kick back, relax and enjoy to the fullest!